It's every fitness professional's nightmare: "I know where the muscle is located, I can see the word in my head, but how do I pronounce it? These terms are so unusual." Even physical therapists, presenters and college professors all say the terms differently. 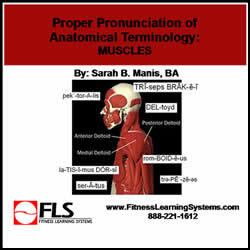 What is the correct pronunciation of basic anatomical terminology? In this course, each muscle is represented with its common spelling, phonetic spelling, a picture, the Latin root of the term, and then the muscle is used in a sentence that helps you learn about the muscle. The best part of this course is that you can click on the speaker icon and HEAR and PRACTICE the correct pronunciation. How good is that! Become familiar with and appreciate the history of anatomical terminology. Understand the roots of Basle Nomina Anatomica (BNA). Discover how initially each university developed its own anatomical terminology making it almost impossible for professors to understand each other's research. Discover the Commission on Nomenclature and how they prompted the Anatomical Society to revise anatomical nomenclature in 1887. Discover how the Commission on Nomenclature worked to streamline anatomical terminology and arrived at several principles which help you to understand the BNA. Learn basic principles for proper pronunciation. Be able to properly pronounce several muscles in the human body. Learn a fact about each muscle you learn to pronounce.